As I’ve said before, I’m in this awkward stage where I’ve graduated college but still haven’t found a job. I know I’m one of numerous people who are searching and searching but coming back up empty. I have no idea when I saved this verse; I don’t remember it at all but it literally stopped me in my tracks. Have you ever had a moment where you feel like God wrote a verse in the Bible just for you? I did about this verse. For months I’ve felt like my purpose was hiding. When I graduated college I had no idea that finding a job and fulfilling my “purpose” would be this hard and take this long. I’ve questioned what I’m supposed to be doing with me life, I’ve questioned my degree choice, my college choice, and questioned every answer I’ve ever given in any interview. It’s taken a toll on me being in this time of limbo. I’ve gotten angry and impatient. I’ve questioned what Gods plan for my life is…I’ve been trying to trust God in this time and seek His will but sometimes, it’s overwhelming. Psalm 138:8 has jumped out and taken over my view of things. 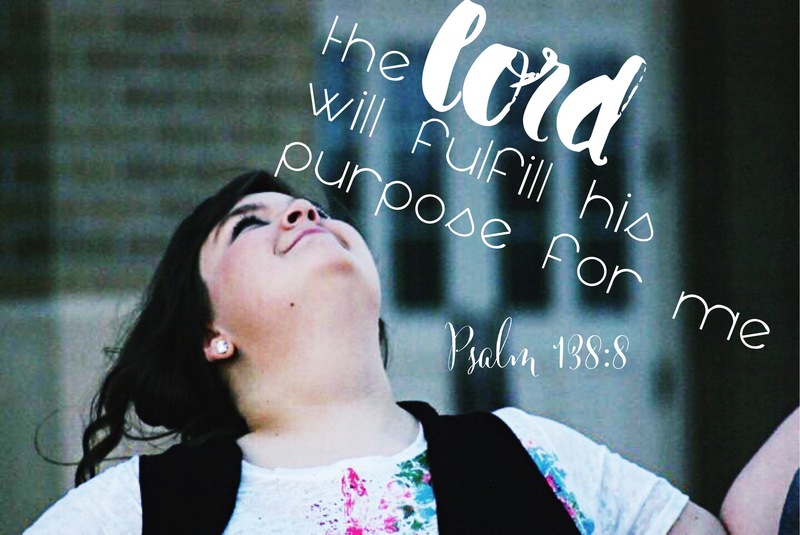 The Lord will fulfill HIS purpose for me. There’s two things I gleam from that phrase: 1). The Lord WILL fulfill it, I just have to wait. 2). There is one key word there- HIS. There’s nothing more comforting to me then to know that God will eventually fulfill His purpose in my life- I just have to be patient and obedient. The Lord has knit together my future and even though I can’t see it, I know His purpose and plan for my life will be far better. I also believe that the Lord can have a different purpose for different seasons of my life. So for now, maybe my purpose is to nurture the kids I watch and grow my blog to speak His name to my viewers. You are not alone in feeling like this! I graduated just over two years ago and my first job out of college was a cashier at a grocery store. I hated it at first, but now I’m incredibly thankful for that experience. God had much bigger plans for me there than simply bagging groceries. I wrote about it here: https://brunetteinbluejeans.wordpress.com/2014/11/15/the-grocery-store-jesus-and-me/. Praying for you as you continue your job search and I look forward to reading more from you! Everything happens for a reason, when I’m feeling at all like this a flick through Psalms is always uplifting and beneficial!